All of the triangles are cut and I’ve started laying out. This is about 1/2 of it (per Paula’s original instructions). I have a whole ‘nother set of FQs so I will likely make this at least twin size so someone can get more use out of it (a nephew, perhaps?). I have some time to decide yet. The Pink One (appropriately dressed) was helping my lay it out tonight. I would like to start sewing but I’m waiting for Paula’s instructions as she said she has some tips for sewing these bad boys together. Because of work and family commitments this weekend I won’t be able to do any sewing…that part will have to wait until some time next week. 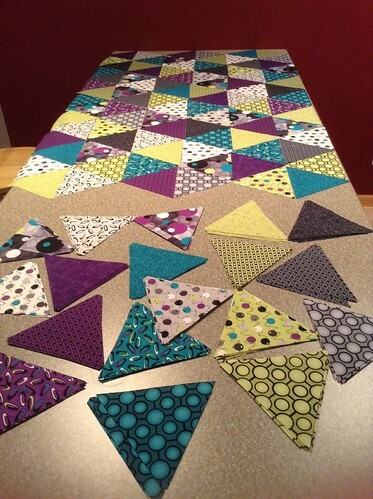 This entry was posted in Quilts and tagged Sassy Quilter, Triangle Quilt Along. Bookmark the permalink. That will be so pretty! Love the colors – And love the helper!! What a fun pattern and fabric! Can’t wait to see it come together. Thank you! I can’t, either! I’m a little worried it will be too busy, but I’m going with it anyway! What a great quilt those lovely triangles will make. and what a great heritage for “the pink one” to remember helping lay out her mom’s quilt. She wants to help in many ways – this is the only way I’ll let her currently! 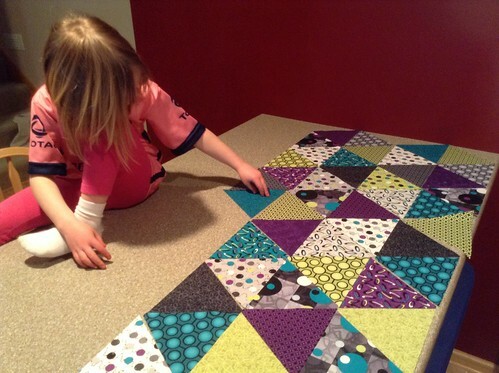 I sometimes wonder if she’ll be a quilter as she gets older. I hope so! I really love these fabrics! I just made a triangle quilt earlier this year and was surprised at how fun and easy it was. What a great quilt along! Aren’t they fun? I am excited to see how it all comes together. I was hesitant about joining the quilt along (over-committed, you know), but I’m so glad I did! Or maybe she’ll be a knitter and make us great scarves and mittens! 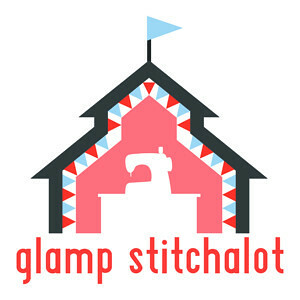 I bought it in Plover, WI at Antionette’s Quilt Shop: http://www.antoinettesquiltshop.com/ (the In-Laws live in Plover). I walked into the store, saw it right away, and knew I had to have it! Call them up – they might ship.